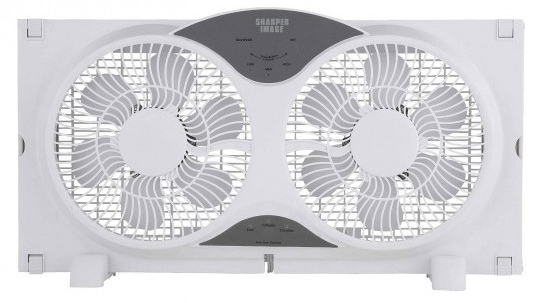 Sharper Image 9" Dual Window Fan Just $47.99! Down From $200! Ships FREE! You are here: Home / Great Deals / Sharper Image 9″ Dual Window Fan Just $47.99! Down From $200! Ships FREE! Sharper Image 9″ Dual Window Fan Just $47.99! Down From $200! Ships FREE! GearXS has this Sharper Image 9″ Dual Window Fan on sale for $47.99 (Reg. $200) when you use promo code 21OFF at checkout! Start living comfortably with this portable twin window fan that transforms your climate indoors. Dual fans are reversible and operate independently while manually reversible intake exhaust allows for either cooling or ventilation. Set on exhaust to create a refreshing indoor breeze that eliminates stale hot air. At night set to intake and draw in cool evening air. You can also circulate fans in opposing directions, creating a consistent circulation of air. This quiet and efficient fan is designed to fit most windows and features three whisper-quiet speeds.